As you've probably already guessed, GoldenEye 2D is a remake of the N64 classic (or best game ever). 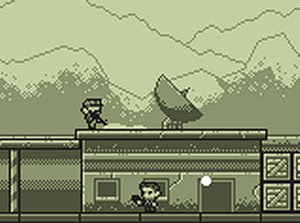 The Dam level has been crammed into a Gameboy styled sidescrolling shooter designed and coded in about 5 days. The missions, level design and enemies are the same as the N64 game, but have been altered slightly to make them work in a sidescroller. Instead of collecting weapons from defeated enemies, this time you'll have to earn them. Fill the experience bar up by killing enemies and unlock a better weapon. Just make sure you don't take too many hits or you'll lose it. Complete the game and get a GoldenEye Ranking. Are you a mighty 00 Agent, or a pathetic Klobb?